Before the brilliant modern classic The Shawshank Redemption came along, there was Birdman of Alcatraz, a melancholy, heartfelt drama spanning several years in a maximum security prison. 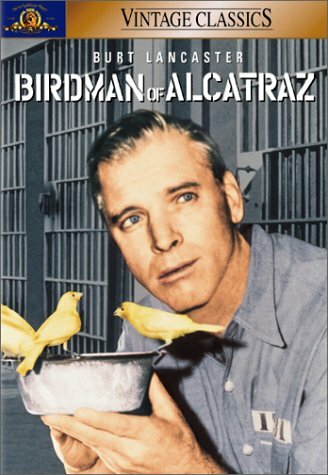 The great John Frankenheimer directs a terrific performance out of Burt Lancaster, who plays a convicted murderer who redeems himself in isolation by becoming a bird expert. It's a thoughtful meditation of prison life and how isolation can really affect your mind and spirit. Warren Beatty and Faye Dunaway are awesome as lovers who rob banks for the headlines and notoriety in Bonnie and Clyde, a violent, shocking drama that took Hollywood by surprise. 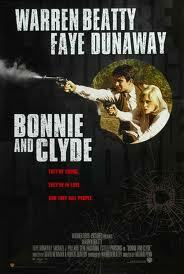 Things get dangerous, of course, when people start turning up killed and everyone wants Bonnie and Clyde dead or captured. And what a cast -- Gene Hackman, Oscar winner Estelle Parsons, and the great Michael J. Pollard provide entertaining support while Beatty and Dunaway heat up the screen with the best performances of their careers. This is a dashing, playful, twisty little caper and I loved every breath-taking minute of it. Cary Grant and Audrey Hepburn are two of the most beautiful actors of their time and are delightfully droll as key pieces to a sinister and scheming game of intrigue, lies and murder. 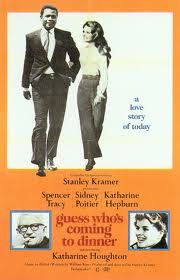 How fitting is it that the director, Stanley Donen, comes from a background of musicals? 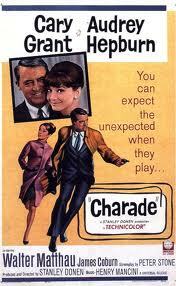 Charade is as sweet as song, dancing lightly on its feet, seducing viewers frame after frame. Walter Matthau, James Coburn and George Kennedy all have great moments to shine, but Grant and Hepburn are predictably, effortlessly, gloriously magic. "What have here is failure to communicate." That's Strother Martin uttering the famous line as the Warden of the rural prison in which Paul Newman and his fellow chain-gang prisoners reside in. Newman refuses to play by the rules and his cohorts watch in horror and delight as he insistently rebels against the system. 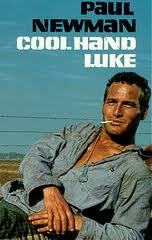 Paul Newman is perfect. Luke is arguably his best role and it's a delicious performance. This is a funny, thrilling character study, easily making it my favorite film from the first 60-odd years of feature-length movies. A classic adventure film of the 60’s, this beautiful epic story features Steve McQueen, Sir Richard Attenborough and James Garner, among others, as POWs not only escaping from their German camp in WWII, but running from their enemy within enemy territory. This is essentially a three-hour ensemble character study (don’t you love those? ), but have no fear; it also includes thrilling chase sequences, clever escape attempts and plenty of humor all around. A great time. This came to me as a complete surprise. Going into this movie, I was expecting nothing more than a comedy of manners sprinkled with a little edgy "race humor." (I suppose I had the Ashton Kutcher/Bernie Mac remake in mind.) Well, clearly, I was dead wrong. This exquisite little movie held my attention from start to finish for a lot of reasons. Two of them are named Katharine Hepburn and Spencer Tracy, who were just magical as Katharine Houghton's parents. They were smart, liberal, open-hearted adults who handled her surprising news (her engagement with the awesome Sidney Poitier) with a little bit of grace and a whole lot of heart. Having died not long after the film wrapped, Tracy's final scene was incredibly bittersweet. As the old Bob Dylan song goes, “The times…they are ‘a changing.” Melvyln Douglas won an Oscar for his role as Homer Bannon, an old-school rancher who is forced to quit the farm and settle into a life of retirement (to a rancher, that’s death). 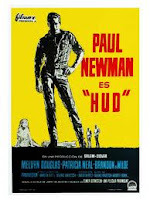 He’s at odds with his son, Hud (ah, Newman), an arrogant farmhand who can’t seem to settle into a routine and is constantly flirting with their housekeeper (Patricia Neal, another Oscar winner). Brandon DeWilde is Lonnie, Hud’s impressionistic nephew who idolizes all three adults on his ranch. Lonnie is influenced by the actions and decisions made by his elders as he heads into a new generation of ranching and sociological changes. Heart-breaking, gorgeous and superbly made. Paul Newman delivers a dark and moody performance as pool shark “Fast Eddie” Felson in Robert Rossen’s wonderful film about character and integrity. Newman is a master at the game of billiards but he doesn’t quite know how to play his opponents. Standing beside him are Piper Laurie as his patient girlfriend; Jackie Gleason, in an Oscar-winning role as Minnesota Fats, as a longtime foe; and the superb George C. Scott as the sleazy manager who takes him in. Every one of these great actors delivers some of the very best work of their vast, wide-ranging careers. Filmed in stark black-and-white, this chilling character study follows two drifters (played by Scott Wilson and Robert Blake) who grapple with their violent nature as they run from one senseless scene to another. 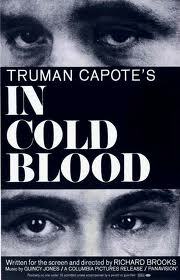 Adapted from Truman Capote's true-life tale, this disturbing drama packs an emotional punch as we witness their crime, capture and death. 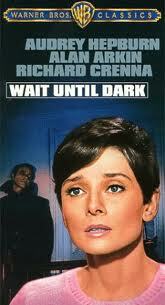 Conrad Hall's cinematography looks gorgeous -- the 60's mid-west never looked so startling and fragile. This one sat with me for a long time after viewing. What a grand Hollywood epic. This movie is magnificent in scope, story and emotional heft, and despite the hurdles he went through, David Lean deserves all the credit in the world for not only getting it made but getting it done right. 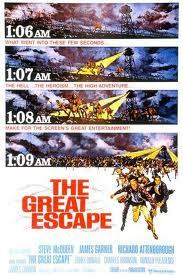 This sprawling four hour adventure is filmed in gorgeous technicolor with vivid and memorable colors and images. The story, of a British officer named T.E. Lawrence (a star-making turn by Peter O'Toole), is involving and well-paced enough to keep the viewer glued to the screen. The sheer physicality of the film, as well as Lean's other masterpiece, The Bridge on the River Kwai, still goes unmatched in Hollywood today. I was expecting funny and I got a hell of a lot more. 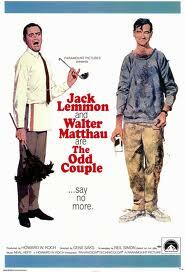 This Neil Simon classic is heartfelt and touching, thanks largely to the pairing of Walter Matthau and Jack Lemmon. These two guys will never be beat when it comes to comedic chemistry and effortless wordplay. Simon's snappy dialogue flows beautifully between these two desperate men as they struggle to live together without killing one another. A big-hearted classic. I did not see this one coming. I knew very little about this film when I rented it and I was simply blown away by it. Audrey Hepburn, as radiant as they come, plays a blind woman who is terrorized by a group of criminals who are searching her apartment for a missing doll. It's stagy -- the film never ventures outside of the loft -- but the claustrophobic style adds to its ever-growing tension. Richard Crenna and Alan Arkin are superb as the main villains who are surprised (as are we) by Hepburn's ability to defend herself. 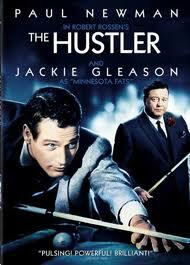 Throw in a little Henry Mancini music and you've got one of the best thrillers ever made.